Phillip Martin Simms was born on the 3rd November 1954, in Springfield, Kentucky, USA. He is best known for being a former American football player, who played in the position of quarterback in the National Football League (NLF) for the New York Giants. His professional career was active from 1979 to 1993. He is also recognized as a reporter and commentator. Have you ever wondered how rich is Phil Simms? It has been estimated by sources that Phil’s net worth is over $14 million. The main source of hi wealth has been his career as a professional football player. Another source is coming from his appearances in several films, and TV shows. Although he is in retirement, there is no doubt that his net worth will become higher as he successfully continues his career in other sporting activities. 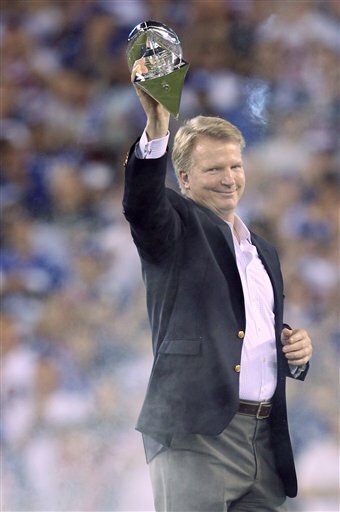 Phil Simms spent his childhood on the family farm in Maple Hill Manor in Washington County, Kentucky. There he enrolled at the St. Dominic’s Elementary, but his family moved to Louisville, so he continued his education at the Louisville Southern High School, where he started playing football for the school team named the Southern Trojans. In 1974, he entered Morehead State University and became a member of the Tau Kappa Epsilon fraternity. While at university, Phil played football for the Morehead State Eagles, finishing his tenure with the team in his senior year, totaling 32 touchdowns and 45 interceptions, with 5,545 yards, which was the record for the university. Phil`s professional career began in 1979, when he was drafted by New York Giants, as the 7th overall pick, which was a surprise, since he had been predicted as a third round pick. Nevertheless, at the end of the season, Phil finished as the runner up for the Rookie of the Year award, losing to Ottis Anderson, and was also selected for the NFL All Rookie team. He stayed with the New York Giants until the end of his career, when he was waived by the team because of a shoulder injury. Phil underwent the surgery, however, he couldn’t recover completely, thus, he was waived by the team, and decided to retire. Nevertheless, his career had been rather successful, as Phil has won two Super Bowl rings with the Giants, in 1987 and 1991, and also earned the MVP recognition in the Super Bowl 1987. Phil participated also in two Pro-Bowl games, in 1985 and 1993. Thanks to his great performance, Phil`s net worth increased over the years, as he signed new contracts with the team. After he retired, Phil became a commentator, firstly for ESPN, but soon he switched to NBC. He is currently working as a commentator for the CBS and NFL Network broadcasts of Thursday Night Football, but has also been host of the show “Inside The NFL” on Showtime. Speaking about his personal life, Phil Simms is married to Diana, with whom he has three children. Their current residence is in Franklin Lakes, New Jersey. Phil’s son Matthew is the quarterback for the Atlanta Falcons, and other son Chris is a former quarterback in the NFL.